It may be a long way from Chester County to dinner in the White House, but Eddy Arnold remembers every step of the way. In his own homey style, the beloved country music singer tells the story of his lifeand it was no instant step-to-stardowm for him. He saw his family's debt-ridden farm auctioned off, and his family become sharecroppers on their "own" property. He knew what it was to be hungry as he played club dates at fifty cents a night and worked in a funeral parlor during the day. Then it started to break. WSM, Memphis, invited him to host the Grand Ole Opry with Minnie Pearl and Uncle Dave macon. He began to record with RCA, go on tours, had a radio program of his own, tried Hollywood, Las Vegas, was beseiged by autograph hunters. He built a beautiful hom; success was in his hand. It couldn't last forever. He seemed to feel another rhythm going on inside his audience, a rhythm he wasn't singing to. He had face what every singer dreads - for he was going "cold". Eddy passed through a period of doubt and indecision, tempted to go into business full-time, forget the music. But singing was his life; music mattered most of all. How could he just quit? During that decline, Eddy began to hear a new kind of music inside himself., softer, other voices harmonizing with his. That was it! This was my style. Call it middle-of-the-road, call it neo-pop, call it anything. He needed that spotlight. Was this the way? Is it possible to create a new image, to regain those personality ratings? Was the advice of his manager worth the risk involved? 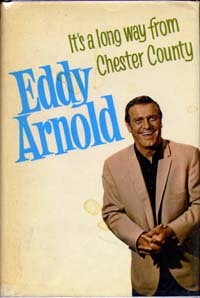 You'll laugh with Eddy Arnold; you'll cry with him. You'll see folks like Johnny Carson, Ginger Rogers, Tom Parker, Dean Martin, Red Skelton, through his eyes. You'll meet a real gentleman, see how he runs his shows, hear his advice to young singers and song writers, and you'll understand why Eddy Arnold made it all the way from Chester County to the top.